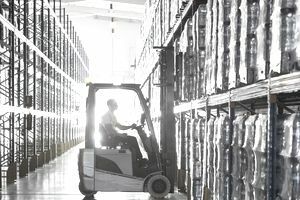 Safety in American warehouses is regulated by a series of standards from the Occupational Safety and Health Administration, commonly known as OHSA. The US Congress created OSHA under the Occupational Safety and Health Act, which was signed into law by President Nixon on December 29, 1970. OSHA issues many publications on safety issues in a warehouse and the solutions that can be adopted by businesses to reduce accidents and minimize injury. The list below is their top 10 areas for which they issue citations. Forklifts can be dangerous. OSHA records about 100 warehouse employees are killed and 95,000 injured every year in forklift accidents while operating forklifts. The majority of fatalities are caused by forklift turnovers. Hazard communication refers to the information about chemical hazards and the associated protective measures that is communicated to employees and employers. Chemicals pose a wide range of health hazards, such as irritation, and physical hazards, such as flammability and corrosion. Chemical manufacturers and importers to evaluate the hazards of the chemicals they produce or import, and providing information about them through labels on shipped containers and more detailed information sheets called material data safety sheets (MSDS). Employees should be trained on the risks of each chemical being stored. Provide spill cleanup kits in any area where chemicals are stored. Store all chemicals safely and securely. Many times electrical hazards are the cause of injuries and fatalities in the workplace. As well as being dangerous in a warehouse it is one of the leading causes of accidents in construction sites. The first step towards electrical safety is controlling or eliminating factors in your warehouse that pose electrical hazards. Ground fault electrical shock is a common electrical hazard. OSHA requires that employers provide ground fault circuit interrupters (GFCIs) for receptacle outlets. Warehouses should provide assured equipment grounding conductor program. Either of these methods can eliminate hazards in ground fault electric shock. The easiest way to avoid falls in the warehouse is by eliminating and controlling fall hazards. This can be achieved by the use of fall protection equipment or devices. There are basically two types of fall protection. With a combination of both, you can ensure a safer environment for employees who are exposed to fall hazards. One type of fall protection is the fall restraint; these systems consist of equipment that prevents a free fall, for example, guardrails/standard railings, full body harness, and warning lines. The other type is the fall arrest, these systems help by stopping a fall in progress or saving an employee in the middle of a fall, for example, the use of safety nets. Many accidents occur each year and most of the time it’s because of the absence or lack of personal protective equipment (PPE). OSHA strictly regulates employers to provide their employees with proper PPE. Many accidents occur not because of absence or lack of PPE but because employees do not wear it. This is particularly true of respiratory protection. In some warehouses, there is the presence of toxic airborne substances. This is where respirators should be used by employees. Respiratory protection is designed to protect the wearer from dust, fumes, paint spray, pesticides and other substances that could bring about long-term or permanent impairment or even death. As with other types of PPE, safety programs provided to warehouse employees must specify the proper ways to clean, maintain and repair respirators. In the warehouse, there is often defective or damaged equipment. It is important that these items are tagged with an “Out of Service” until it gets replaced or repaired. This will keep employees away from items that may cause serious injury or illness. According to OSHA, the tag is “a device usually made of card, pasteboard, plastic or other material used to identify a hazardous condition”. Many companies are cited by OSHA because tags are not used in the correct way.